You can call this her second chance. A technicality led to her resignation as Miss Philippines Universe 10 years ago and Tisha Silang is making sure that history does not repeat itself. In 1998, Tisha won the Miss Philippines Universe crown but had to give it up because of her Canadian citizenship. 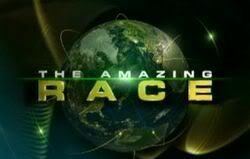 While that win has remained the proudest moment of her life, she's hoping that taking part in The Amazing Race Asia will trump that. Joining her is her boyfriend of three and a half years, Geoff, and by all accounts, participating, much less winning the race will be an uphill battle says the couple. For one thing, their relationship is the classic definition of opposites attract. "Nobody would have thought that we would end up dating. We have very different personalities but have managed to make it work so far," notes Tisha. Quips Geoff on the first time they were introduced by a mutual friend," I was interested in Tisha for obvious reasons. And Tisha wasn't interested, for obvious reasons." This is also the second time that the couple has auditioned for the show and the couple almost missed the deadline too. "We were in such a rush to submit the video I can't say we did anything really spectacular," Tisha admits. The last and most important reason against them has to do with their horrible track record when it comes to traveling. While on vacation in Boracay, the couple missed not once, two but three consecutive flights back home to Manila. And by that time, they were broke as well. Tisha says with a laugh, "And now we want to race together...should be interesting." Fingers are crossed but hopefully, the two won't be making the same mistake again, especially on the show. "Missing a flight, I think that is the most embarrassing thing you can do while traveling," admits Geoff. But rather than to lay blame, the couple made the best of their situation. "Tisha was shooting for FHM and we were supposed to be there only for the weekend. By then we had spent all out money in re-booking and extension fees. But time flies when you're in love and having a ball." And the other reason for wanting to be in the race is of course, to counter the loss of Team Philippines from the previous season, jokes Geoff. Marc and Rovilson came in third in the last show. He says, "We have huge shoes to fill after the stint that Marc and Rovilson pulled off." Nonetheless, the couple is certain that they will bring to the race the love and respect that has been the foundation of their relationship. Geoff says, "Tisha and I have had a sound relationship, from the time we have met. And now we are testing our relationship, by entering the race." He says, "We have huge shoes to fill after the stint that Marc and Rovilson pulled off." What? You're going to mug for the camera? You're going to fake being lost at the mat? You're going to wear fake mustaches? I'm not liking this team and I haven't seen a minute of them as of yet. GEOFF: Our battle plan for the race was just not to rush things and (not) look like an idiot on TV. Who else is already annoyed with Geoff? I hope team philippines will win this season.. im really sad for the last season so i hope this year philippines will make a difference this season!! go geoff and tisha!!! I can't help but route for this team and other people don't understand why lol. I guess I just like the competitive ones. yah me too.. that's y even though i know that there's a 99% that vince and sam will win becoz of the sony ad..
i stil hope (The remaining 1%) that they will win hehe!!! I read Bernie & Henry now have a Sony ad so? Race of their life --New Interview!! IF you’ve been following the exciting last few episodes of “The Amazing Race Asia 3,” you know that real-life couple Tisha Silang and Geoff Rodriguez have had their share of arriving first in the pit stops. Tisha: I think during the first couple of episodes, we were still trying to get used to racing together. Geoff: I agree. As the race has gone on, we’ve learned so much more about each other. T: Now that we’re near the end, we’ve put all the fighting out of the way. G: Besides, it’s normal for relationships. T: With dating, sometimes you don’t really get to know anything about the other person. This race has changed everything. T: All the teams are pretty much neck and neck at this point. And we don’t have an alliance with anybody. G: You know, looking back, we knew we weren’t the most liked—we were likely to be yielded anytime. G: The word to describe that would be refreshing. See, we had a chance to place first in the first episode of the race and we gave it away. Placing first now was more rewarding. We were on a total high. T: That if we could just keep the bickering aside, we could do anything. G: This whole thing was just great for us. wow peach thats wonderfull thank you for the article!!! Of the F4, anyone but them to win. oh my god i saw henry and bernie's sony advertisemet and that makes me happy haha..
i have now 50% hopes that G&T can win hehe.. It's nice to see ARA3 team members getting what appears to be good appearances for good compensation. Geoff and Tisha are after all models. I saw them yesterday afternoon walking along Salcedo Village in between the China Bank Building and the Citibank Tower. They were holding hands and walking towards Paseo De Roxas. wow zippo ur so lucky i wish i could see them in person also!! hehehe... congrats geoff and tish for being d 2nd place overall.. that nice but its really better if u won!! but still congratulations hehe..
During the night, it seems that Geoff couldn't keep his eyes--and hands--off the big check from AXN for one hundred thousand US Dollars......and even snuck off with it in the end! I wonder if he tried to cash it too?! woah.. i just realized that geoff was the one who greeted marc and rovilson in the nokie phone video hehehe..
and he was labeled as sam whahahahaha!!! !